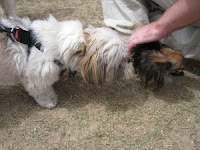 We had such a fun day at the Gold Coast Pet and Animal Expo. We got a lot of freebies, bought at lot, learned a lot and Cooper had some fun meeting the other animals of all shapes and sizes! 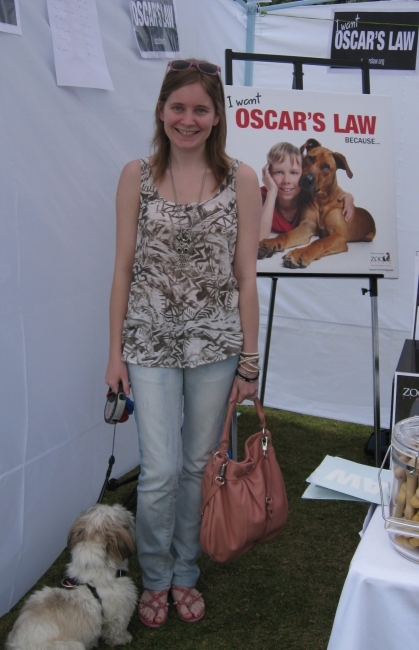 Definite highlight for me was the Oscar's Law stall where I spent a good amount of time talking to one of the lovely volunteers there about how to do more to help bring change and see the end of puppy farms. Would be so nice to see an end to puppy farms in Cooper's lifetime. Cooper was too worried about the mobile hydrobath next to the Oscar's Law stand to turn and smile for the photo. He was scared it was bath time! The singlet was last worn here, jeans here, sandals here and bag here. Ooh owl necklace, love it ^^ Nice bag too. Nice pictures!! I love your necklace! It seems like you had a great day. Cooper looks adorable. Is he a trouble maker or is he pretty calm? you're so lovely! 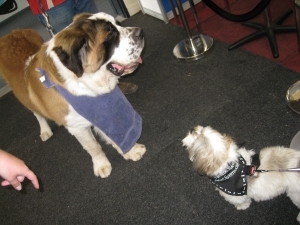 We sure hope that puppy farms are shut! Such a cute print tank, and I love the light pink accents you added! love this blog. following u.. wanna follow me back?? HAHA Cooper! That is too funny! No bath time for him! He's hilarious! Very cute outfit Mica!